6.00 am I am up by around 6 am. My usual routine is to have a good breakfast while I listen in to the local and international news. BBC radio 4 have an excellent business slot at 6.15 which I try to listen to and which serves as a good brain download of what's topical in business and financial markets internationally. 7.00 am I try to be on the road by 7. I am in the process of getting used to a new commute to work as we have just moved office from our old base in the IFSC to Investec's newly refurbished and expanded floor space at the corner of Harcourt Street and Adelaide Road. These bright and airy 'state of the art' offices have more than helped us get over any nostalgia we may have for the IFSC. It's been a very busy year of integration with our new colleagues in Investec post the acquisition of NCB this time last year. And never more so than in the last few weeks in which we have gone through the process of rebranding NCB Wealth Management to Investec Wealth & Investment. Building on NCB Wealth Management's significant and leading local presence, we are now part of a leading international private client investment manager with over €47 billion in assets under management and all the resources that brings. The Investec Wealth & Investment brand and organisation brings our clients additional comfort in its scale, international reach and depth of investment processes. As part of the integration process, our headquarters in Harcourt Street now brings together under one roof 230 Investec specialists across the various disciplines of specialist banking, treasury, corporate finance, capital markets, venture capital, wealth and investment. 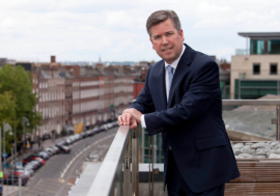 Our chief executive, Michael Cullen, who has led Investec in Ireland since their arrival in 2000, has been at the forefront of leading the acquisition and integration process which has built on the existing structured equity and treasury businesses led by Loman Gallagher and Aisling Dodgson respectively. 7.30 am I like to be at my desk with a coffee by 7.30. I use the next hour to gather information and to plan the day ahead. Along with reading the daily newspapers there are a couple of excellent sources I routinely read to get a sense and understanding as to the current context in the financial markets. Before the European markets open at 8 our trader and I review any outstanding client orders and alerts on any individual stocks. While we find the primary needs of our clients these days are around discretionary and advisory investment management and financial planning, unsurprisingly given our origins, traditional advisory stockbroking is still a strong feature of our business. Greg Dilger, the head of wealth & investment, and I take some time to review the previous day’s business, the day ahead and any other issues that require attention. 8.30 am At 8.30 each morning we get together as a team. This meeting begins with an overview of market developments and a preview of the day ahead. Depending on the day it is, the emphasis might be on either client meetings, business development, topical financial planning issues or an update from our investment committee. We find this a useful collaborative forum for coming together as a team and sharing mutually beneficial ideas and insights. 9.00 am As the later part of this morning and a lot of my day will be taken up with client and internal meetings, I use the next couple of hours to review client portfolios, make client calls, follow up by putting the agreed actions in place and respond to client queries and requests. We are supported in this by a terrific middle office team in Nancy, Denise and Siobhan that make it all happen seamlessly with remarkable efficiency and good humour. 11.00 am At 11 we have our regular weekly meeting of the investment committee. The committee comprises 8 of us, a combination of 'wise old owl' market strategists in Paul Callan and Bernard McAlinden (less of the old they'd say!) and practising investment managers. We may also draft in specialists within the group in Ireland and the UK on particular economic or investment topics from time to time as we need them. The purpose of the meeting is to review how our investment allocation frameworks are tactically positioned. We follow a rigorous process of review of all the various asset classes and asset managers we invest in from equities to bonds and across the various geographies from both a fundamental and technical analysis view point. 12.45 pm Next up we have a working lunch meeting at our office with a long standing client. Ordinarily he has come to us looking for investment advice but given his plans to retire later this year, this meeting is primarily around financial planning. I have asked my colleagues Andrew Fahy, a tax specialist and Joe Hanrahan our pensions and retirement planning expert to join us and bring their specialist knowledge to bear as we look to create the right solution for the client. This will involve us going through a thorough financial questionnaire to ensure we've established all the relevant facts. 2.00 pm We are joining a conference call with our research colleagues in Wealth & Investment in London. They have just produced an internal research report on an investment trust which we feel may be suitable for our clients. With 6 full time research analysts across international equities, investment trusts and fixed income, access to the depth of private client focused research within Investec Wealth & Investment has been a really positive and tangible benefit of our integration process. 3.00 pm Time to catch up on market developments, emails and to make some client calls. I ask my colleague Cristina to prepare some documentation for tomorrow's meetings and gather the valuations and the presentation she has expertly prepared for a client meeting later this evening. 4.30 pm We travel out to meet a client at his offices. This case is not untypical in that we manage money in a personal, pension and corporate capacity for this individual and his family. He is joined by his finance director and I am joined by my colleague Paul Callan, our director of asset allocation. This meeting is to review the portfolios, describe the current financial context plainly and to set out our strategy for the time ahead. Paul spent 30 years as a fund manager successfully managing up to €11 billion in assets across equity and bond markets. He has made a very considerable contribution to our asset management capacity, a key strategic focus of ours in recent years and brings a wealth of investment knowledge to meetings like this. Again, not untypical, our client continues to hold a significant proportion of his wealth in cash. While intuitively this is perfectly understandable given the turmoil in financial markets and the on-going recessionary environment, he is becoming increasingly frustrated with the prospect of getting a return that is not even meeting inflation. Our role here is to create the right asset mix that protects the purchasing power of his money over time but with a manageable level of volatility that is consistent with his risk profile and tolerance. We aim to achieve this by creating portfolios of well diversified assets, blending 'best of breed' asset managers with some direct holdings, as and where appropriate. 6.00 pm At 6 we conclude our meeting, I check my emails by phone and then it's time to head for home. It being the last week before summer holidays means no school homework for the kids and none for me to check! That means I can get a walk in and enjoy the summer’s evenings while they’re here. It's a school night for me too, so bed by 10.30 so I'm ready to do it all over again!